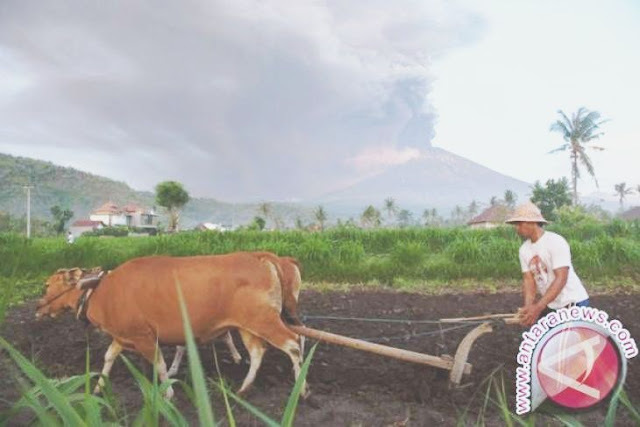 The Indonesian Volcanology and Geological Disaster Mitigation Center (PVMBG) has raised the alert level of Mount Agung from three level to four level, indicating eruption hazards on and near the volcano. "We raise the status because the eruptions of Mount Agung have shifted from phreatic to magmatic ones, since red glow was seen from the peak of the Mount Agung on Sunday at 9 p.m. local time," I Gede Suantika, mitigation head of PVMBG, said here, Monday. The magmatic eruptions produced thick ash continuously at a height of between 2,000 and 3,400 meters from the volcano`s top. He predicted that larger explosions might occur as it is indicated by continuous ash puffs that are sometimes accompanied by explosive eruptions accompanied by a weak sound of boom heard at the radius of up to 12 kilometers from the mountain`s top. The danger zone has been expanded from six kilometers to eight kilometers from the volcano`s peak. People within 10 kilometers towards north, north east, southeast, south and southwest, were told to evacuate. Villages located inside the danger zone are Ban, Dukuh, Baturinggit, Sukadana, Kubu, Tulamben, Datah, Nawakerti, Pitpit, Bhuana Giri, Bebandem, Jungutan, North Duda, Amerta Bhuana, Sebudi, Besakih and Pempatan. The danger zone could change any time depending on the condition of the volcano. Meanwhile, the Bali airport authorities have closed down the I Gusti Ngurah Rai International Airport for 24 hours following the eruptions of Mount Agung. "The airport is closed beginning at 7 a.m. Central Indonesian Standard Time (WITA)," Arie Ahsanurrohim, spokesman of state-owned airport operator PT Angkasa Pura I`s I Gusti Ngurah Rai International Airport, said, Monday. Volcanic ash has covered the air over the airport at the second level, forcing the closure of the airport from 7 a.m. local time on Monday until 7 a.m. on Tuesday. The Indonesian Transportation Ministry has issued a notice to airman no. A-4242/17 regarding the closure. Based on data issued by PT Angkara Pusa I, 57 international flights and 39 domestic flights were canceled from Saturday until Sunday at 11:59 p.m. local time. Located in Karangasem, Bali Island, the 3,142-meter-high Mount Agung has been rumbling since August. Records since 1800 reveal that Mount Agung had experienced four mega eruptions, respectively in 1908, 1823, 1843, and 1963.